In my recent photo it is obvious that I have tried to maintain all the "youthful values" many of us grew up to appreciate during our special "summer of love" 40 years ago. I moved to the Seattle area in 1982 & shortly thereafter met the girl of my dreams who, as you can see, shares all my values, a definite formula for happiness. Life is great here in the northwest. I have prospered as a real estate developer over the last 15 years. My wife Francine & I have two teenagers. Ben is 17 & Ellie is 14. I obviously started my family much later than some of you grandparents! I look forward to returning to Mpls next month for our reunion and visiting with all who can attend. From Alan : Great to read all of the bios from classmates. I'm an attorney in downtown Minneapolis. Married for 34 years, with a 29-year old just married son living in Philadelphia, and a 25-year old daughter living in SanFrancisco. I'm still living in St. Louis Park. In fact, in the 90s I spent 7 years on the SLP School Board. I had the privilege of giving a retirement certificate to Mr. Olson, our old psychology teacher. If I had known I would be on the school board some day, I would have paid more attention to what was going on in high school. Looking forward to seeing everyone at the reunion. From victoria (vicki): I've been in Maine since 1984. It took about 20 years to feel at home in New England. I am still a mid-westerner at heart. After a 23 year marriage to a man I met at an anti-war rally in 1971... we parted. We have 2 great kids... 29 and 25. I am blessed to be in a second marriage..9 years now. I live on 4 acres... in a passive solar house. We have a big garden, chickens and good neighbors and friends. I was a private practice psychotherapist for 30 years and am now retired. I live in "vacation land" and consider myself lucky to hear the crickets at night and see deer in my field. I have fond memories of sitting on the steps with Wendy Sotobeer listening to Janis Ian (so alternative!) I loved singing in the chorus. Great times autograph chasing with Perky Tjornholm and her father. I adored Ms. Jones for turning me on to literature and Mr Loengering for giving me permission to think. It does feel like 40 years have gone by... 400 sometimes. I wish everyone the best. From Rodney: Hard to believe it has been 50 years since our graduation. I have been married 36 years and we have 3 children. My wife works downtown in accounts payable for Hennepin County. Our oldest son works as an IT specialist for the state of Minnesota. Our second oldest son works as a driver and rep for Pepsi and his wife works as a U. of Minnesota student housing rep. They had their first child and our one grandchild last October. Our daughter works as a lab scientist for Mayo Clinic in Rochester. I have been retired for 8 and 1/2 years after working more than 36 years as an auditor for the federal government, while my wife still works for the county. We have done a lot of traveling the last few years and I have season tickets with friends to U of M sporting events. I also enjoy being a part time day care provider for our grandson. From Michael: It is now May 2017... last year in May we came to Ft Myers, Florida to find an area we wanted to move to... we ended up buying a house in a gated 55+ community. I retired in June, Donna retired in September and we moved down permanently in October. We put in a pool and are living our dream. With our son in the Army and our daughter living in New York, we decided we wanted to escape the MN winters and moving near either of them was not an option. We have now gone though our first winter in Florida and absolutely love it here. Now we look forward to the summer. We plan to make a trip back to MN for 5 weeks. 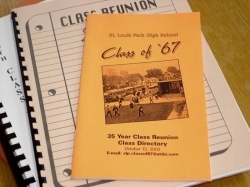 We will attend the 50 class reunion and two family reunions as well. And... we will take one more opportunity to pig out at the State Fair. We look forward to the reunion... 50 years is such a milestone to celebrate. I hope everyone makes a great effort in attending. All the planning does make the reunion great... it's all the people that come that make it the best. Like everyone else, I can't believe it's been 40 years. And I can't believe it's time to plan another reunion. I only wish we could find everyone's current information and invite them. It would really be something to have everyone show up. We still live in Maple Grove and as the registrations come in, I surprised how many classmates live close by and wonder why we don't run into each other. Family update: Our daughter lives in South Hampton, NY with her husband and two of our grandchildren... with a third on the way. Our son, at the age of 36 joined the Army. We just got back from his Ranger school graduation in Ft Benning, GA. He and his wife Sharalyn, along with our other 4 grandschildren will be moving from Minneapolis to Ft Lewis Washington. Sadly now, no quick or easy visits to see everyone. See pictures in the photo section, under 'Current Album'. I would like to encourage everyone to upload pictures to he website! We have plenty of room and it makes it fun for classmates to visit the site often. Be sure to put your name and title for the picture. From Kim: I was a Senior Buyer for Dayton's (may it rest in peace) and Target for 22 years. I have been married to Eric Strobel for 20 years. I quit working in 2000 to make life living hell for my two daughters Leslie a sophomore at Colgate University and Krista a freshman at Creighton University (we are moving her in on August 18th). I do volunteer work and play golf as often as possible. From lynda: My husband and I enjoy visiting our 4 sons and 2 grandchildren, our home on Elk Lake in Michigan, and tending to our home in Minnetonka. While my husband continues to work, I follow my very active mother's social schedule on a part-time basis! I paint for the love of painting but would love to sell some art some day. Very technologically challenged, so unable to "upload anything". I am a natural blnode. Have a great time at the party. All my yearbooks were destroyed in a fire many years ago. If anyone has an "extra" that I can purchase - Please contact me. Thank you. From Rick: Still live in the Park. Been married to Cindy for 36 yrs. (class of 70, sister of classmate Linda Richards). 2 kids Christy 34 John 30. 3 grandsons 8 6 and the new one 4 months. Been a paramedic for 34 yrs, and with the same company for 30. Like to fish hunt and be "crazy" on my 4-wheeler. My only changes in 40 yrs is I gain 20 lbs and grew my hair long. Oh ya can't forget the glasses and hearing aids. Only traveling I've done is to Viet Nam and Germany. (army) See ya at the reunion. From Susan: Hard to believe it has been 40 years. I have been married to Paul (Hopkins Class of 67) for 36 years and we have two children, Joe (27) and Lindsay (23), who both live near us in Minnetonka. I have worked at General Mills for 21 years and don't have any immediate plans to retire We enjoy taking cruises and spending time on the North Shore. From David: 40th Reunions bring out the "R" word - for retired. A year ago I retired from a 28-year career with American Red Cross; for six of those years I was CEO of two field units. I quickly came out of retirement, though, to become executive director of a mental health counseling agency, Crisis Connection. I also teach part time at the University of Minnesota. My wife, Linda, and I pass our 38th anniversary two days before the reunion. We began dating when I was editor of the Echo; she the editor of the school newspaper in another 'burb. We have three grown children, and one five-year-old grandson. This past fall we began the condo phase of life, and live right on the Twin Cities' great light rail line. It's a great lifestyle and we recommend it to you and the other 70 million boomers. From Kathy: Hi Everyone! I am a retired Healthcare IT executive recently working under Obama's Reinvestment and Recovery Act automating physicians in So Ca. I live in the mountains in so Calif. and in Maui depending on the weather. Still a water lover, scuba diver and underwater photographer - having fun, life is good, very busy. Love the ocean... had to be that Surf Belle background that made me end up on the ocean! From Diane: Hi everyone. I've been married 22+ years to a great man, and we have a wonderful 20-year-old son studing jazz performance in college near NYC. I have a law degree and with my M.S. in clinical counseling I do premarital and marriage counseling in Eugene, OR. I'd love to hear from people who remember me. I'm finally ready to do this! I am hoping to attend the reunion and see you all.